All kidding aside, escape rooms are a great activity for those that hate scary Halloween haunts because they're, at most, stressful. Unlike haunted houses, there is nothing too terrifying about an escape room. Nobody is jumping out and making you wonder why you paid someone to do this to you (usually). If you like games and puzzles, this might even be an exciting hour for you! But not all escape rooms are made equal. 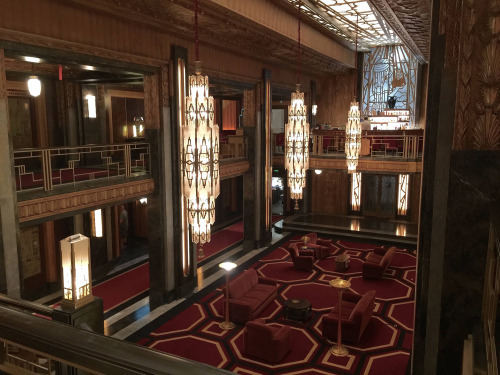 The lobby is reminiscent of a few different haunted hotels, like The Hotel Cortez (American Horror Story) and The Hollywood Tower Hotel (The Disneyland Ride — RIP), with red accents and a wooden concierge desk, along with old school chandeliers and lighting. 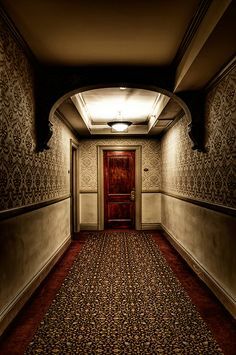 The hallway that leads to different escape experiences, include doors that are painted red, a la haunted The Stanley Hotel in Colorado. (Although the hotel doors appear more of a mahogany red wood finish). When you enter, Motown hits are playing. For some, this is comforting. "They're playing happy music! It can't be scary!" But I couldn't help but feel like the juxtaposition of the happy, upbeat music with the eerie hotel setting could result in something terrifying. Spoiler: it wasn't that scary. And they vary in their difficulty. Our group of 11 chose Witchcraft and Daycare since we were forced to split into two. I had to escape from the Witchcraft Room, and we had a great time figuring out each clue bestowed upon us. Going into the room is the most terrifying aspect of it all, because you don't know what to expect. Like most escape experiences, you have one our to "get out," and in our case, that meant getting into a second room, and then finding out way out of there. The production value for Escape Hotel Hollywood is better than any other experience I've been a part of. While trying to decipher each clue and figure out what each element meant, I was also curious how certain clues were able to unfold for us — the execution was perfect. I don't want to give too much away, but, for instance, at one point we had to use a Ouija board to unlock a particular clue, and whenever we ran the planchette over the correct letter, it would light up. There was also an awesome effect involving a blacklight that impressed me as well. Sadly, we did not make it out in time! As we were unlocking the last clue, our time was up. Overall, I think we could have done it if we had a smaller group — less than 5 people. The other group told us Daycare was actually terrifying, and mentioned something about dead babies hanging in a closet, so if you're into grotesque action like that, perhaps that's the room for you. One cool aspect is that EHH gives you a passport that gets stamped after you complete each room, kind of like a badge of honor for getting through each experience. If you get a minute this Halloween season, check it out and let them know I sent you!